Once a poem is sent out into the world it takes on a life of its own. Sometimes the poem is on the page, painted on the ground, in film, art, or music. It belongs to whoever has requested it, whoever needs it, receives it, and ripples out from there. Writing poetry isn’t always a solitary act. With the Spontaneous Poetry Booth, I invite the public to sit down and create poetry with me. When someone asks for a poem, I treat it as an emergency request. The process is simple: I will ask you two or three questions, and will offer or write you a poem—in five minutes or less. Sometimes the poem works, and sometimes it doesn’t, but either way it captures a moment of reflection for that participant. It invites people into the process of creation and often it can reflect an experience that has not yet been articulated. The Spontaneous Poetry Booth has been featured at festivals, events, and hospitals. An adapted version of the booth, specific to healthcare, is called Rx for Poetry. Sometimes poetry meets the world in unexpected ways. I work with architects, artists, health care practitioners, managers, educators and any one trying to create something new, or to bring a different energy where it is needed. Poetry can offer a moment of reflection in a chaotic place, a way to engage with a civic environment, or a portal into the imagination. 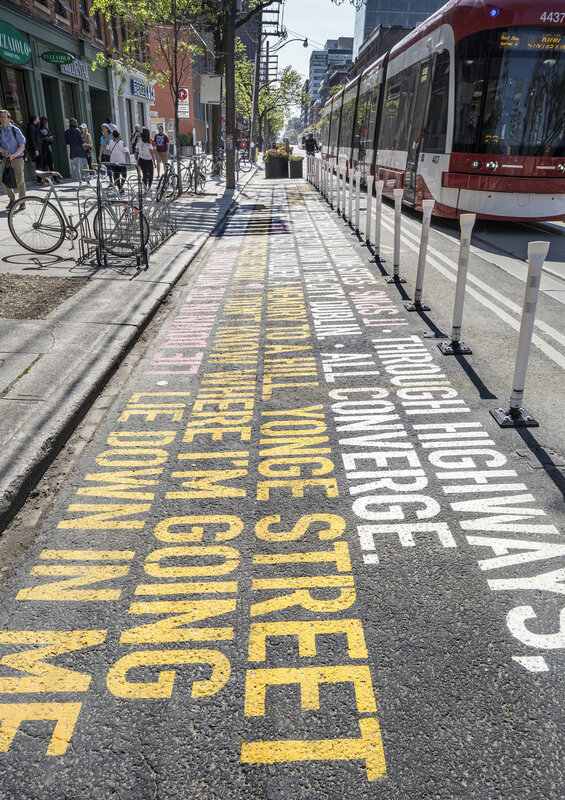 Recently, PLANT architects took my poem “The City” and painted it on King Street in downtown Toronto. In “Asphalt Poetry” the letters are a foot high and the poem itself is 30 metres wide. Reading this poem becomes a physical act of walking back and forth along a city block. Artist Yaara Eshet took 15 poems from my book, The More, and created a series of illustrations. The poems and images were featured together in the exhibition. Hello, Other Moon at the Miles Nadal Jewish Community Centre. Filmmaker Midi Onodera used the poem “Grief Without Fantasy” to inspire a short which was an official selection at the Toronto Urban Film Festival.